Much water has flown in the history of Madhya Pradesh's Dhar district. The legendary romance of Rani Rupmati and Bag Bahadur has found indelible expressions in numerous waterbodies of the district's fort town Mandu. Most of these traditional water harvesting structures were built by Bag Bahadur for his love Rupmati. The people during that time had a fascination for water. It seems the district is now reliving its fabled romance with water. As the state's week-long water conservation campaign, Pani Roko Abhiyan, started on February 3, some 2,400 people of the drought-affected villages of Pannala and Hemabardi took up water conservation activities. As one enters these villages, one can see handpumps, roof water-collecting funnels and filter tanks installed by the residents. From this, the water collected is diverted towards the tubewell for recharging. Mohini Shrivastav, a development officer, seeing a house's wastewater flowing across the road suggests, "Make a soak pit so that the water can get filtered and then go for recharge." The villagers do it instantly. Water conservation campaign is the theme of the state government's annual Gram Sampark Abhiyan, where the authorities meet the villagers to create a better atmosphere for governance. After the community based watershed movement under the Rajiv Gandhi Watershed Development Mission (rgwdm), the current campaign was to start a massive social movement for water conservation in all the 51,806 villages of the state. Water conservation has been given top priority in the state's agenda as it faces the second consecutive drought. "We plan to build many water harvesting structures in the next four months, but the important point is to sustain the whole movement," says Manish Rastogi, director, rgwdm . Though a statewide campaign, districts have been given the freedom to evolve their own strategy to create awareness. For each district, one official has been deputed to coordinate the campaign and at the village level, the watershed committees, formed under the rgwdm, spearhead it. "From 240-280 kg per hectare (kg/ha) before the 2000 drought, crop yields have now come down to 120 kg/ha," says C S Vhadwania, an agriculture development officer. So the villages started harvesting water. "This year there was no drinking water crisis," says Bhawar Singh, a villager. A team of local residents and government officials spearheaded the Pani Roko Abhiyan. Villagers are deepening a tank at the far end of the village. This talab serves as a tank for the livestock of all the villages within its vicinity in this hour of drought. Problem areas The movement has also served as an opportunity to assess the administrative lacuna. Jamnia, a village overlooking Mandu, is an example. Though it has taken up watershed activities under the rgdwm , the village could not participate in the Pani Roko Abhiyan. The project officer says that since the village has recently been declared a town panchayat, the campaign could not be taken up. This case shows that administrative glitches can stop a movement from reaching the village. Even for the watershed mission, some officials doubt its sustainability. Says J Sharma of Sardarpur block: "The response for the Pani Roko Abhiyan has been good in non-watershed villages, but not for watershed villages. In a watershed village, the villagers know that it is another campaign, while in a non-watershed village, the villagers find it something new." But participation largely depends on the ability to motivate. Maurgaon is a micro-watershed village under the Sardarpur milli-watershed with a population of about 2,000. Being a watershed village, the villagers have developed a notion that the watershed committee governs all water works. They were not aware of the committee for the Pani Roko Abhiyan although they knew about the abhiyan . It is to be observed here that this may lead to confusion among the villagers about whom to approach for what purpose. Says Rastogi: "To avoid confusion, in all watershed villages, the watershed committee is responsible for the Pani Roko Abhiyan. Under the abhiyan , they decided to channelise rainwater from the rooftop to pre-dug recharge trenches. "This will help in recharging our handpumps." Tribal quest In the tribal dominated district of Jhabua, the watershed mission has worked wonders -- naked hill slopes have turned green. But with decreased rainfall, drought has set in. The abhiyan was initiated in this district with a lot of fanfare. Large posters with pictures of flowing water across green valleys are displayed with attractive slogans like bharo duwara kuen mein jal, tabhi chalegi apni nal (Fill your wells again, then only the taps will run). "I have been visiting villages as a part of the campaign, but the reaction of the people is slow, but positive," says Wasim Akhtar, collector of the district. 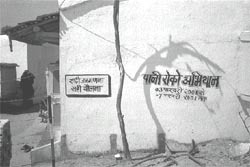 In Jhabua, many constructions of harvesting structures started prior to the campaign. Though there is a resource crunch, funds have been made available through the many schemes to make 201 new tanks, remodel 137 old tanks, recharge 1,524 handpumps and 2,143 dugwells. There is also the Food for Work is a World Food Programme (wfp) scheme, where the villagers provide labour in exchange for food. If a person digs a 10 metre (m) deep well with a 6 m diameter, then the wfp makes available 600 kg of wheat and 60 kg of pulses through the public distribution system. The abhiyan has picked up momentum, but most of the villagers have migrated to nearby states due to drought. "About one to 180,000 people have migrated to Gujarat and Mumbai," says Sachin Sinha of the district. The response of villagers varies from place to place. In the watershed village of Dhedkenia, the villagers have gathered for the abhiyan and a 12-member committee has been formed. However, the motivation is lacking, as most villagers want just food. The officials ask them to take up well digging, but the villagers say that the gradient of the land does not support wells. But after much persuasion, they agree to dig wells. The villagers are slow in accepting watershed activities, as an ngo was involved in embezzlement of funds and poor construction of structures. "They made check dams without shutters," complains Pangli Bai, the village sarpanch . In Malpur Badi village of the Bhavra tehsil, the Pani Roko Abhiyan was started with the making of a boulder dam. "Now we are constructing a mehbandi ," says Karn Singh in his Bhili-Gujarati dialect. This village comes under watershed, yet there is drought due to insufficient rainfall. Most of the villagers have migrated. In Pratap Phalia village of Udaygarh tehsil -- one of the villages where agriculture is still being practiced -- people have starting digging wells. "Tomorrow, we start our water harvesting activities," says Kamal Singh Ajnar, the sarpanch . About 14 km from this village is Kankakar. The activities here are more dynamic. It also has a history of water works from the old days. A soak pit is being made to harvest roof water. It is interesting to see the 81-year-old sarpanch with a fractured leg move with the team. Staring blankly at the barren land, he says, "Before there were teak, mohua and bamboo trees. But now I am sad, there is a lot of losses due to the loss of forest". The abhiyan is underway and someday, there may be teak and bamboo sprawled over the land.